The last few weeks have been filled with thinking about art…art appreciation with picture study, art appreciation with artist study, art skills, art projects, art supplies, art FUN. Now it is time to think about making plans for my sons. This is a glorious time for my brain and my heart. I am loving the process of really drilling down through all the options to make my boys’ last few years of official homeschooling filled with art they will love. You would think that with all of the art plans floating around my computer’s hard drive that I would have one plan that would fill the need, but after looking seriously into what I have left planned for high school I couldn’t find anything that was “just right”. This means I get to pull some fresh ideas from my shelves and from my bookmarks for both Mr. A and Mr. B who seem to be heading in different directions as far as art interests. Mr. A doesn’t have as much time in his daily schedule next year (12th grade) for going too deeply into art courses, but he still assures me that he wants to have some art plans available to make use of time he can carve out of his busy day. Mr. B is going to be saturated in art-related topics next year (11th grade) since he seems to have a leaning towards the creative. They enjoy picture study and really getting to know an artist. They like getting to pick an artist to study on their own and also picking their own artwork to view. 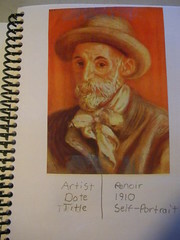 They still think that keeping a notebook with prints and their own short artist’s biographies is a meaningful activity. One son wants to focus on follow-up of picture study with art copywork at his own pace and with his own choice of art media. So what do you do after picture study? This activity has been the backbone of our art appreciation plans for many, many years. If picture study was all we had ever done in our family, we would have developed a love for great artwork. But now looking back, I can see how building on picture study has enriched the experience in many ways. I am going to share with you my original art goals that I wrote about eight years ago. 1. 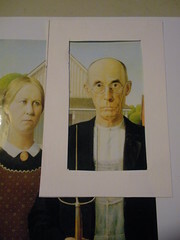 Be familiar with and able to identify at least 30 major works of art by the end of high school. (artist’s name, title of the painting, and the time period) This would be approx. 4 pieces per year between 4th and 12th grades. 2. Be able to view a painting and discuss the elements of the painting. 3. Be familiar with the major periods of art in order to place a piece chronologically on a timeline. I look at the humble beginnings of our art appreciation study and it makes me feel really good inside knowing that we have achieved and surpassed my original goals. This whole process started off simply and has grown from those little seeds planted with picture study. 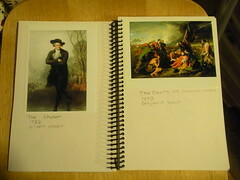 For more information on how to include picture study with your children, you may be interested in reading this blog entry: Art Appreciation Starting Point. I have a second part to this post that I will put up on Wednesday for you to read. In that post I will share how we have built on the foundation of picture study over the years so you can glean some ideas for your children. Thanks for the art post. Can I ask where you get your prints for your art notebook? I have trouble finding affordable prints larger than postcard-sized. Any suggestions? I print out our own copies for study using my color printer. I decided a long time ago it is much easier to do it that way. My daughter always has hers printed from Shutterfly and they turn out good enough for a study copy. She makes sure to use prints that are in the public domain. Terrific post! Thanks for letting us in that brilliant mind of yours! You are really inspiring! The incredible thought and planning is truly a ministry to the rest of us who are trying to give our kids a very high quality of education but struggle to keep all the balls in the air! This is another excellent post! I have been doing a lot of thinking about our art study too! This is the first year we *really* did picture/artist study and the boys LOVE it!! We are starting Monet this week and I have been planning projects to do with our study in order to “dig deeper”. Looking forward to Wednesday’s post! Your comment ‘thinking about ways to make our home more creative’ is essential to me as well. What I really want is my daughter to grow up in an art- studio rather than a school, a museum or even a library. To live in a place were art is created is probably the best inspiration for a child.